The above photo was taken when the South Korean President Lee Myung Bak visited India. 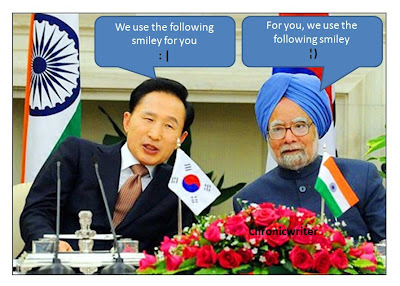 This conversation between Manmohan Singh and the South Korean First man was overheard by our waste correspondent. 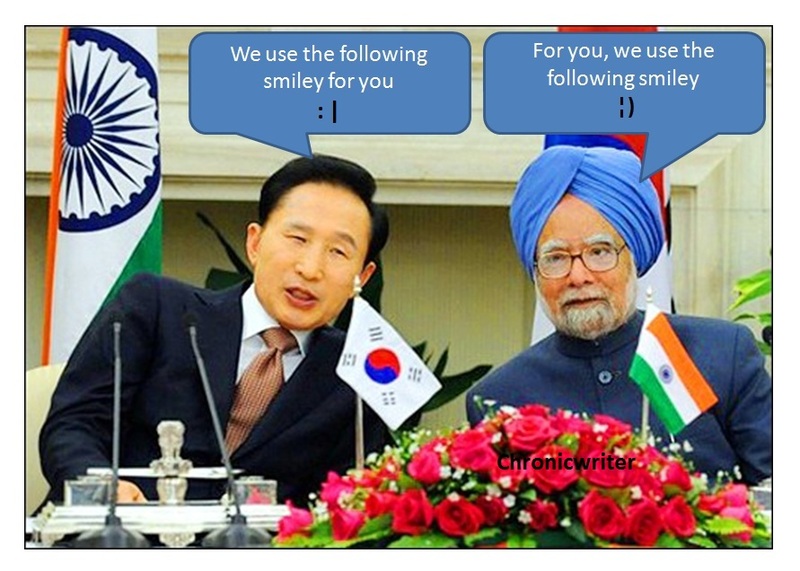 Now the social media chat platforms are working on for creating the Manmohan smiley and the Lee Myung smiley. The above photo was taken when the Thai President Yingluck Shinwatra met the Indian Prime minister. Many people around the globe call Manmohan as a mute Prime minister. But we should remember that Mr.Manmohan Singh has single handedly tackled all the rocks thrown at him with one great weapon and that is SILENCE. Someone somewhere said that Silence is the best answer to many questions. Our PM lives that quote. I am not being sarcastic here. He has the power to quench fiery darts thrown by Rakhi, Arnab and Sidhu. Such is the power of MUTEness. Back home, we always fight for the remote control. When my mom uses the remote control, devotional channels will run on TV. When my sister uses the remote control, it would be some sitcom. When I use the remote control, it would be Nat Geo or the sports channels. When my dad uses the remote control, it would be the Channel Scan button which would be crying for mercy. Similarly the congress supremo Sonia used a powerful weapon and that weapon has even tackled Anna Hazare. A fan mailed me and said, " Chriz, your posts should be informative". Now you know the name of the presidents of two countries through this post. Even I struggled hard to find the name of the Thai President. At first , i thought she must be a Chinese lady and googled for Manmohan Singh with Chinese lady. It gave me dangerous search results. Then I searched for Japanese lady, Korean lady, Hong Kong, King Kong , Taiwan and finally found the name of the lady when I searched for Thai lady. So great hard work has gone for constructing this post. When ever I talk about hard work, a few people come to my mind. One such person is Power Star Srinvasan. He has taken the world by storm with his acting prowess. He is the complete package; every girl's dream man and he has the charisma of Rajnikanth and the talent of Kamal Hassan. One should watch his movies before their death. If you watch his movie, that would indeed be your death day. 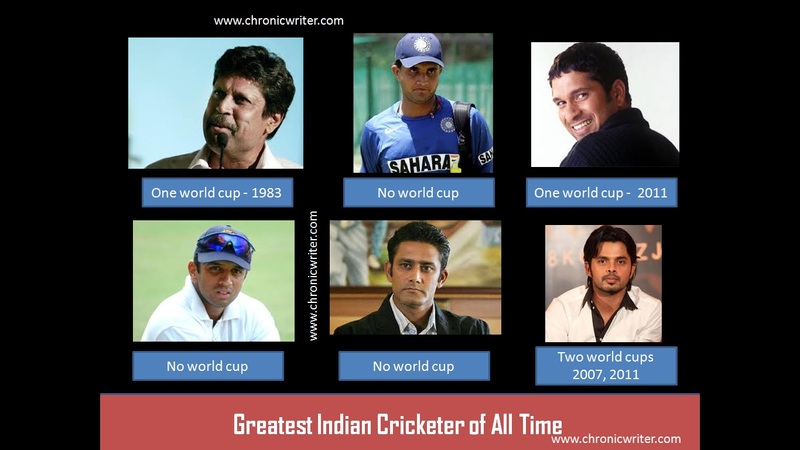 Finally, I would end this post with one of the greatest statistical calculation ever made to find the best Indian cricketer of all time. This is the result of the greatest research. Great post as usual Chriz. By the way i have nominated you for the Liebsters award since i have been following your posts for quite some time. All the best and keep up the great work you have been doing.